The basic idea here is obvious at a glance: Guests sit at stools on one side of the counter while the cook acts as master of ceremonies on the other, barbecuing and serving up the food much like a chef at a Japanese grill restaurant. The winged shape and the ample width of the counter are carefully chosen to create intimacy without a feeling of claustrophobia. The counter has plenty of space for setting out buffet items as well as tableware. The counter was designed to blend in with its surroundings. 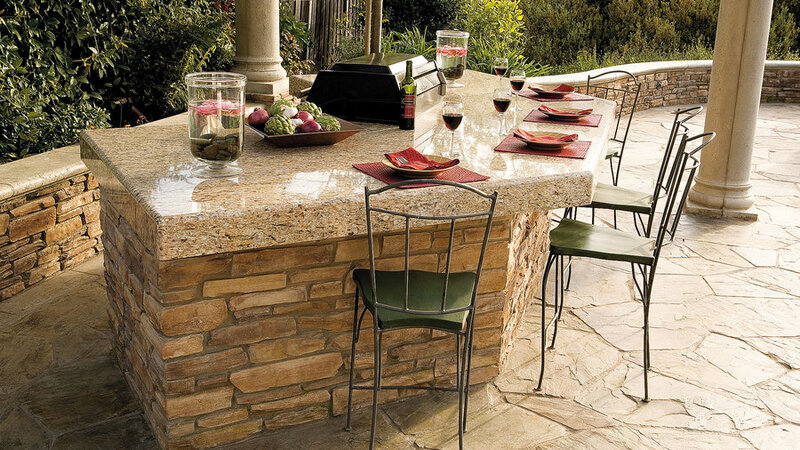 The same stones are used on the nearby wall, the granite countertop is an attractive neutral shade, and the grill is only partly visible from most vantage points. The countertop is symmetrical, with two wings each at an angle to the central section. On the cooking side, each section is 6 feet long. The countertop overhangs the counter by 3 inches on the ends and on the cooking side, and it cantilevers out 12 inches on the dining side for comfortable seating. The grill is placed in the center of the cooking side. The granite slab counter is 1½ inches thick. At the edges, a strip of granite is installed underneath to give the appearance of being 4 inches thick. You could choose instead to install a countertop made of tile, decorative concrete, or slab stone. There is only one appliance, a high-quality grill large enough to handle several cooking tasks at once. The grill is fueled by propane, so there is no need to run a gas line. Two electrical receptacles, located on the cooking side of the counter, supply power for small appliances or a rotisserie. A reinforced concrete slab supports the structure and forms the floor inside the unit. The walls are built of 6-inch concrete block. A structure like this could also be built with wood or steel framing and concrete backerboard. The blocks are faced with faux stone, which comes in a wide variety of colors and shapes and is fairly easy to install. The joints between the stones are filled with mortar. Pouring the footing, building the block walls, and covering them with faux stone are all within the capabilities of a handy and strong homeowner. Applying the faux stones is not difficult, but it will take some practice to learn how to fill and tool the joints. Installing the granite top is definitely best left to granite specialists. Before you begin work, buy the grill and the doors and make sure everything will fit. When figuring the openings for the cooking units, don’t forget to take into account the thickness of the countertop. Have the units on site when you build so you can periodically check their fit. Plan the placement of all the blocks. Unless you have a prescribed space into which the unit must fit, you should be able to plan the installation to minimize the cutting of blocks. Consult the granite company when you plan the building of the walls to make sure that the cooking units will fit after the granite is installed. The footing for this project is 8 inches wide and 24 inches thick, but check with your local building department to make sure you comply with its codes. Excavate and build forms. Run electrical conduit for the receptacles. Install horizontal reinforcing bar as required by code. If you will fill the block cells with concrete, also run vertical rebar, carefully placed so it will run up through every other cell. Pour and finish the footing. After allowing the slab to cure for several days, build the block walls. At the door opening, install angle irons and then 2-inch block on top. This opening needs to be carefully sized. If the grill requires them, build a solid support and an enclosure. Apply mortar to the block wall using a notched trowel, then set the stones in the mortar. You may need to use temporary spacers to keep the stones from sliding down while the mortar is wet. Fill the joints with mortar and tool them. Once the counter is built, have the granite company come out and measure for the countertop. The edges should be smoothed and polished so they shine like the rest of the countertop. Granite is impervious to most stains, but you may want to apply a sealer anyway for extra protection. Hook up the grill to the gas line. Apply silicone caulk to seal the flange, then install the grill in the opening. Install the doors and apply caulk to seal out rain.